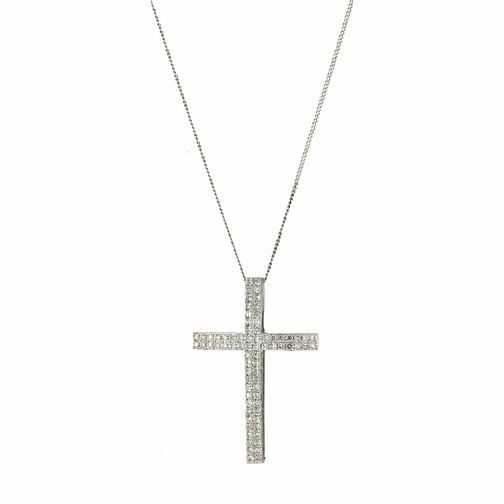 An elegant cross pendant crafted in 9ct white gold and set with a total half carat diamonds. A dazzling accessory for any occasion. Elegant diamonds for the woman of your dreams. 9ct white gold 0.50ct diamond cross pendant is rated 5.0 out of 5 by 4. Rated 5 out of 5 by Anonymous from Beautiful piece of Jewellery This beautiful necklace was a gift from my husband but i chose the necklace as it caught my eye.... the pendant is not too small or too big it’s a perfect size... I’ve had so many compliments when wearing the necklace... Great value for money also.